The Southern Co-Operative chose trusted, long-term partner, TDS Electrical (TDSE) as the main electrical contractor on its largest ever new-build project at Freshwater, Isle of Wight. TDSE has worked with The Southern Co-operative for over fifteen years on a projects ranging from store upgrades, lighting audits and energy-saving LED retro-fits to the design and installation of imaginative and sustainable lighting systems at new developments such as Freshwater. TDSE provided a comprehensive, turnkey service for the Freshwater project which included all electrical work, consultancy, design and installation of customised LED lighting. TDSE commenced work with a virtual blank page as far as electricals and lighting were concerned. 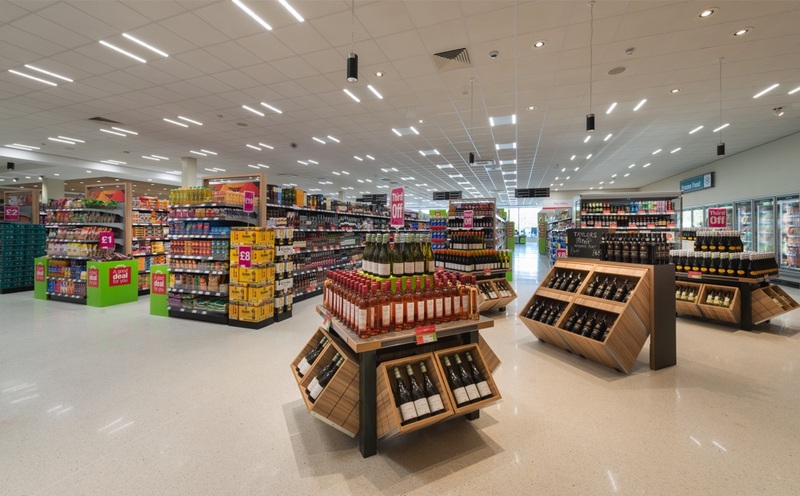 There were two main objectives: to design and install electricals and LED lighting that conveyed the creative intent of Brighton-based CDW and Partners innovative design and supported the Southern Co-Operative’s sustainability aims. All electricity used by the Freshwater store comes from renewable sources through a green energy contract. For the lighting, we worked in partnership with Spurlite, globally renowned lighting designers. Two options were presented based around the architects original concepts. Both options were total LED solutions, but they also gave the client options around design and budget constraints. The chosen design was developed over a 6 month period and evolved during that time along with the clients budget. The final scheme included Suprlite’s Freyn LED panel with an enhanced lumen package to cater for the height and the required lux levels, DOT downlights in both recessed and surface variants, Avior Motion adjustable LED mounted in bespoke Rafts, Tubus Cadan pendants and finally a pendant fitting which Spurlite created especially for this project to be a focal point in the entrance, mounted in between the rafts. 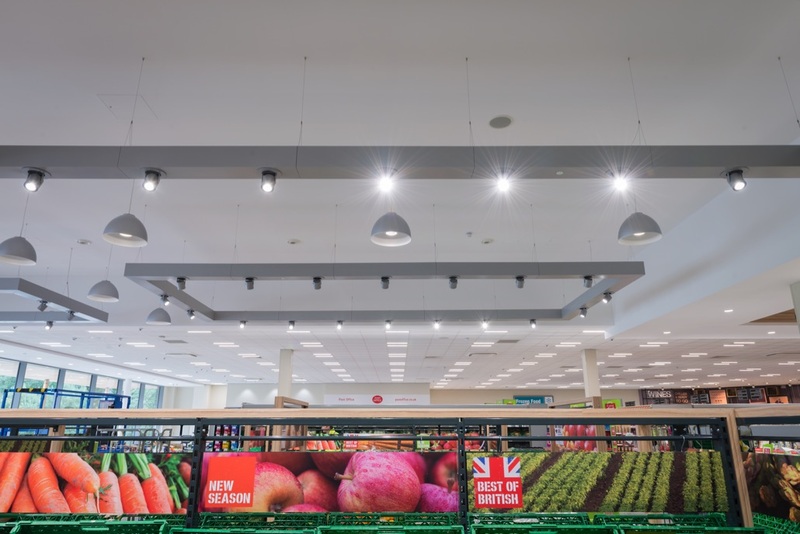 This multi-dimensional LED lighting system, installed by TDSE, has been called “the best lighting even seen in a mid-sized supermarket”. 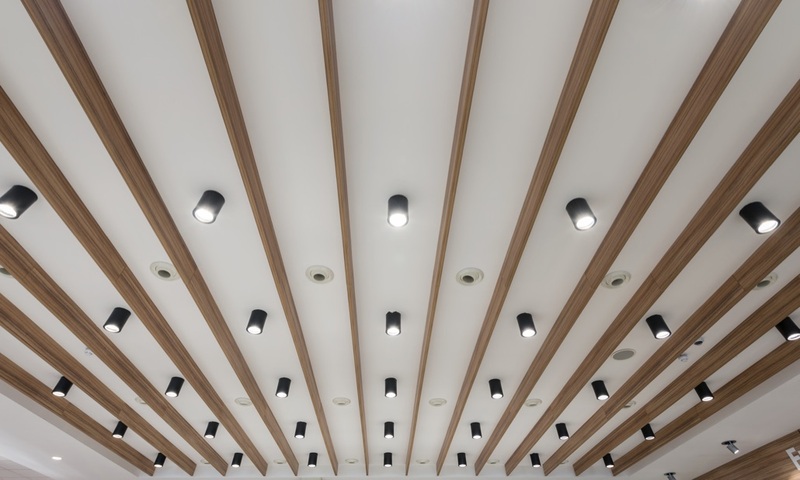 All LED lighting and electrical elements supplied by TDSE meet the highest regulatory standards, including BREEAM and 17th Edition NIEEIC. We ensured that we designed each area/section with the customer in mind, using lux levels, colour rendering and colour temperature in such a way so as to maximise the shoppers experience and bring a different dimension and feel throughout the store. Despite having a massive range of goods and services on offer within the relatively limited confines of a 14,000 sq. ft. ‘box’, Freshwater conveys a sense of space and light. It helps that the layout isn’t the linear aisle format found in the majority of mid-sized supermarkets. Instead, a free-flowing ‘market square’ takes up around 40 per cent of floor space. Lighting also plays a significant role in endowing the store with a warm and welcoming ambience. Unlike the ‘flat’ panel lighting found in most supermarkets, the LED lighting system at Freshwater has a natural vibrancy and is easy on the eye. It’s also proving to be 60 per cent more efficient that standard lighting systems. Each of the different areas within the store has customised lighting rafts in tones appropriate to the products on display. 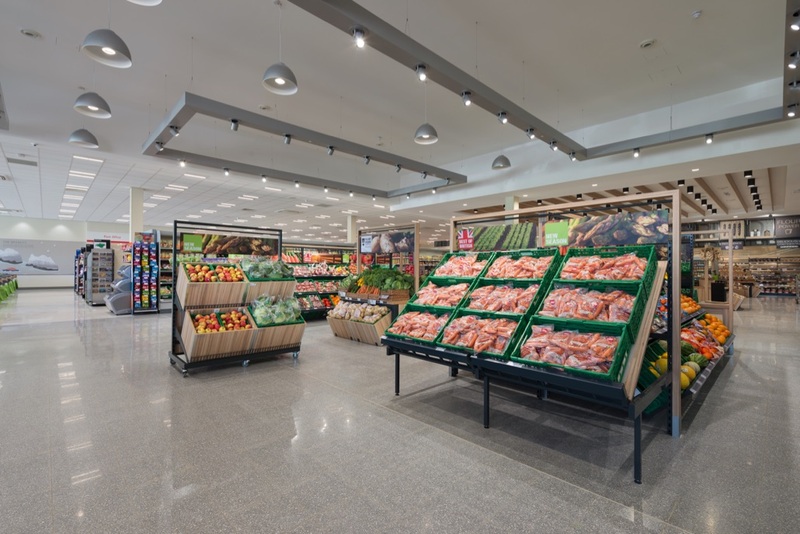 Lighting is also used to focus customer attention on specific product displays and key areas and enhance product colours, for example, in fresh fruit and vegetables. For the Southern Co-Operative, energy-efficiency doesn’t end at the shop door. TDSE installed a charging station which customers with electric vehicles can use free of charge. In addition to bringing upscale supermarket shopping to the Isle of Wight, the Freshwater project is of strategic importance to the Southern Co-Operative. 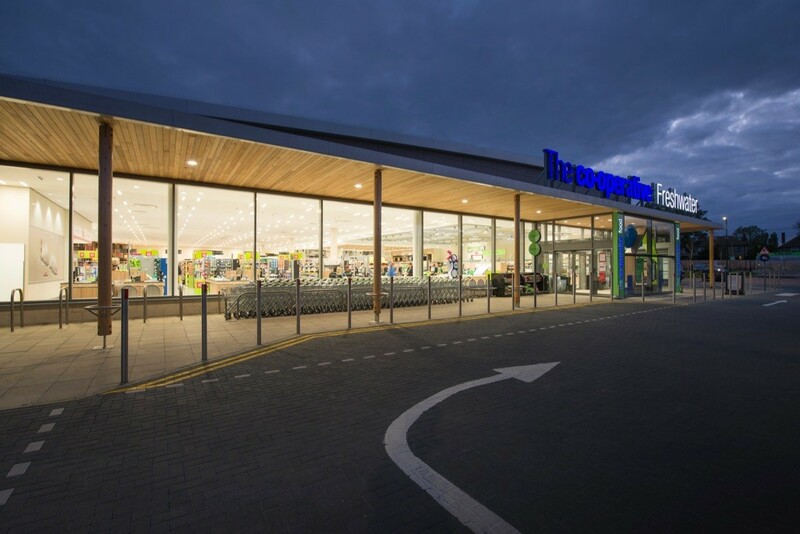 With the success of the Freshwater store, the Southern Co-Operative now has a proven template for a more exciting, community-focused local supermarket, elements of which can replicated quickly and cost-effectively in any store – existing or new build – across the Southern Co-Operative’s network.